Flatworms, also called planarians, belong to the phylum Platyhelminthes. Characterized by flat bodies, they have no circulatory or respiratory organs and a very simple digestive tract. This body plan limits them to very small, flat shapes to allow them to absorb oxygen and moisture. However, a flatworm’s body contains the beginnings of more complex structures found in other animals. For example, eye spots resemble the ancestral forms found in more complex animals. Understanding flatworm sensory structures can help you understand the origins of these organs. Flatworms show a trait called cephalization, a trait related to their sense organs. Organisms with cephalization have a defined head area. This adaptation allows organisms to concentrate their sensory organs towards the front of their bodies, allowing them to preferentially sense the area in front of them rather than the area behind them. While this adaptation may seem like a no-brainer to an organism like a human, it gives flatworms the ability to concentration sensor organs and nerve structures in the front of the organisms. Flatworms have prominent eyespots. These constitute the flatworm's most prominent sensory organs. However, while the eyespots resemble eyes, the organs are much more simple. Eyespots consist of a single layer of photosensitive cells. The photosensitive cells contain a pigment that reacts to light, and signal nerve cells when they do so. The eyespots have no lenses to focus images. Due to their simplicity, eye spots cannot produce images. Instead, the eyespots can only tell light from dark. Many flatworms have auricles. Auricles consist of angled projections from the sides of the head, which gives some flatworms' heads an arrow-shaped appearance. Auricles contain concentrations of nerve cells. These nerves are sensitive to both touch, moisture and certain chemicals. The angled projections increase the surface area for these nerves and allow the flatworm to distinguish which side the stimulus is coming from. Flatworms lead a simple existence; instinct determines their actions. Most of their reactions consist of slowly moving away from negative stimulus. 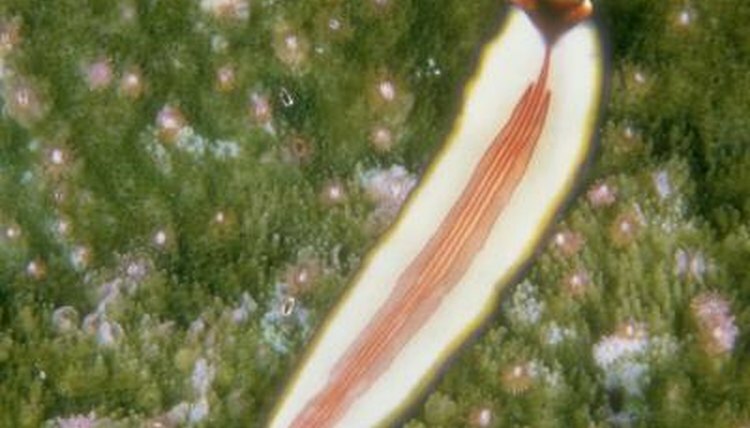 For example, when flatworm eyes detect light, a flatworm will turn in the direction of whichever eye is less stimulated. This means a flatworm will avoid light and move towards darkness. Flatworms avoid light, since they need to keep themselves damp and avoid predators. By shunning direct sunlight, flatworms increase the chances that they will avoid predation and dessication. What Structures of a Worm Receive Stimuli?